Tripura Government Jobs page will help everyone to get information about govt job opening by Tripura state government. Every year Tripura State Government publishes recruitment Notifications for Tripura Govt Jobs available in various sectors. Here we are providing all types of Latest Govt Jobs in Tripura regularly.Government jobs in Tripura – Upcoming Govt Jobs in Tripura: Tripura Government provides recruitment notification every year and publishes various types of Latest Tripura Govt jobs available in all sectors. In our website, we will update Upcoming Tripura Govt jobs with all details to benefit Freshers/Experienced candidates including all educational qualifications like SSC/10th pass, PUC/Intermediate/12th pass, Engineering, Graduation/Degree holders/PG degree holders. We have given a table below with current govt job openings in Tripura state. It has all the required information like the Last Date, Eligibility, Post Details and Number of Vacancy. 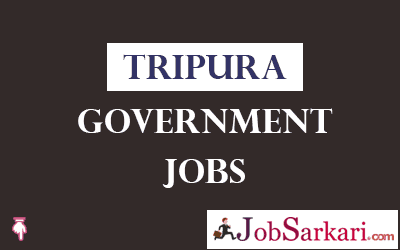 If you wish to get more information about any Tripura Government Jobs then click on the post title given there and you will get complete details like How to apply, Important Dates, Age Limit, Useful Links to apply for the job vacancy and more. If you find this page useful we urge you to bookmark this page now by pressing CTRL+D or Keep visiting our site Jobsarkari.com for more latest and immediate update regularly.